Why remove them? Cars drive over tram tracks all the time in Melbourne? We are definitely in "The Future" and can tell you we are suffering still from that fateful and short-sighted decision to remove the trams. Oops, sorry, having a Queenslander moment there. Were Brisbane Trams standard guage back then like the new Gold Coast light rail? And because of this the Melbourne tram network is without a doubt the slowest public transport system in the country. It's all day, all route average speed was a tiny 16kph in 2013, and every year it falls further. There are a lot of reasons the Brisbane network was closed, some of them good reasons, some of them not. But "making space for cars" was never one of those reasons. It's a myth. Perhaps the main reasons were that the trams were old technology that wasn't designed for traffic congestion that was starting to appear by the sixties. This old tech (primarily underpowered motors with poor acceleration vs traffic and mechanical brakes with poor brake performance vs traffic) meant that even fairly modest congestion by today's standards could obstruct and significantly slow down the trams, creating delays and unreliable OTP. In short the problem was not that cars needed more room, it was the trams that needed extra space. This lead to the perception of a problem, and there were basically three solutions. 1) Solution 1 would have been to remove cars from tram routes. I don't know if this option was ever looked at in detail, but in any case, it was rejected on ideological grounds (Clem Jones later said that he didn't consider alternatives because he didn't believe that a man who could legally buy a car should be prevented from then driving it wherever he chose). 2) Solution 2 would have been to move the tram tracks out of the mixed traffic lanes and into dedicated reserves. Unfortunately Brisbane had only just finished concreting the tracks into the middle of the roads, and the funds to rip up and move all this nearly new track simply weren't there. 3) Solution 3 was to close the trams and replace them with something that handled mixed traffic better - buses. This option had a lot going for it. Firstly, the City was just starting a phase of rapid low density growth into areas outside the tramway system. These new areas were too numerous and too low density to support tram service right away, so the council had already acquired a large fleet of buses to provide service to these outer areas. In other words, the council already owned many buses. Secondly, buses had already proved themselves in practice, with many peak hour special trams being run by buses ever since the depot fire and the ensuing tram vehicle shortages. These bus operated specials were routinely faster and more reliable than the trams on the same route and had thus become more popular than the trams on these routes. Thirdly the fact that all new routes and all extensions of existing routes were being worked by buses meant that conversion of the tram and trolley worked routes to diesel buses offered synergies such as simplified maintenance and one seat rides to the outer suburbs. Knowing what we know now, perhaps one of the other options would have been better. (Melbourne ran into these same issues around the same time, but for a variety of reasons held off for 10+ years before finally going for option 1 which had by then become politically palatable. Although it bears mentioning that the implementation of option 1 in Melbourne is still only around 20% complete and has been controversial since day 1). However two things are certain, the system was broken and simply letting it continue to run as it was for another 40 years wouldn't have fixed it. Melbourne tram is superb. A great people mover. I grew up in Melbourne and am very familiar the network. It can be a bit slow at times, so what .... try catching the tram to St Kilda or Port Melbourne. Brisbane trams at their peak carried more passengers than the present bus and rail network combined. Brisbane's tram network was not big, but well concentrated where it needed to be. Brisbane would have evolved a much better place had trams been retained. The tram network would have evolved if it had been retained. However, it is all downhill at present hey? With BCC and it's despot public transport view points. Many parts of Brisbane's tram network did have own reserve. Certainly to Chermside (dedicated ROW in the middle of Gympie Rd) and Carina (Old Cleveland Rd median). It is true that there was far less traffic on the roads than there is today. Cars were expensive, and much of the enabling freeway infrastructure had not been built yet. I don't really buy the whole 'handles congestion better' thing. Today where the trams were not running in dedicated ROW, you have buses which stop in the road and block the left lane. They also get caught in congestion - not much difference there. I think the only read advantage of the buses was in the lower density areas and running express / rocket buses which have a long non-stop section. That's harder for trams to replicate. The vid above has a nice segment on the dedicated ROW Beaudesert Road Salisbury. There was even a bit of dedicated ROW at Ascot/Clayfield. What might have been hey? Light rail/tram is not really an option for Inner Brisbane these days. Cost alone prohibitive. Until BCC gets sorted, the network will limp along. Probably the best that can be expected will be electric super buses operating on the key frequent routes, busways and priority on major arterials. Brisbane is fast becoming the nation's transport joke. Which is a sad sad indictment on BCC, and the state governments that lack the courage to sort it. Brisbane is fast becoming the nation's transport joke. Which is a sad sad indictment on BCC, and the state governments that lack the courage to sort it. I think the council has been coasting on its past for far too long. They all need to be dumped and given a good jolt. Maybe they will wake up then. Not confident about the challengers for mayor though, they seem to be as exciting as wet lettuce. I think it's quite well demonstrated by two things. 1) That in Melbourne, the average tram speed across all routes (including routes such as the St Kilda route that is in reserve the majority of the way) and across the whole day (including uncongested times) is around 16kph. The Melbourne bus network all route, all day speed is around 25kph (broadly similar to elsewhere in Australia). 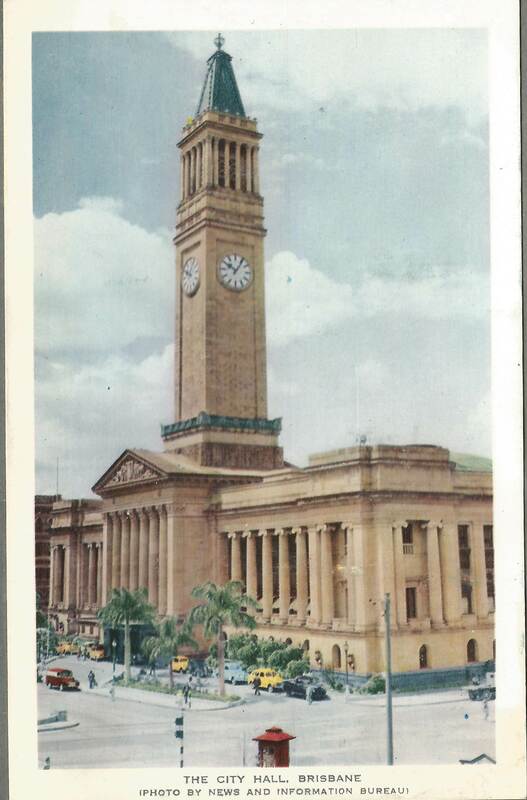 2) In Brisbane during the sixties, tram shortages led to some peak hour services being operated by buses, and these bus services rapidly became more popular than the trams, with anecdotal accounts of passengers ignoring passing trams and waiting for a bus. But even if this wasn't true in the general sense (about busses and congestion), it was thought to be true at the time, which from an historical perspective is basically the same thing. And maybe it was true in the particular Brisbane instance because of the obsolete design of the majority of the Brisbane fleet. At closure, the most numerous class of trams, had been built in the 1920's based on a pre-WWI design with underpowered engines and poor brakes. This design meant that the trams behaved in traffic less like buses and more like trains with long acceleration and braking distances. It's not a perfect comparison, but to help picture the problem, imagine the impact that even a small amount of stop start car traffic would have on train reliability if a section of the main line was paved and shared with cars. A large part of what saved the trams in Melbourne was that the most numerous class of vehicle, the W-class, all featured a modern, congestion friendly design; either built in as original equipment, or retrofitted via a program of strategic investment in the fleet and network. This meant that the congestion problem was less critical in Melbourne, allowing the sunk cost fallacy (related to the strategic investment program) to be argued, which bought the trams enough extra years for public tastes to change. Perhaps. But the tram and bus services are concentrated in different geographical regions of the city. Buses tend to be infrequent and in the outer areas where congestion is lower, and trams moreso in the inner suburbs. The speed difference could be a reflection of that, rather than the mode. It is also difficult to believe replacing trams with buses would be helpful - labour costs would explode as bus capacity is a fraction of that for trams and some of these newer LRTs. The second observation is that we need something to compare to. Perhaps the speed has gone down, but has the speed of general car traffic in the same area gone down also? What matters is the relative speed between different options. 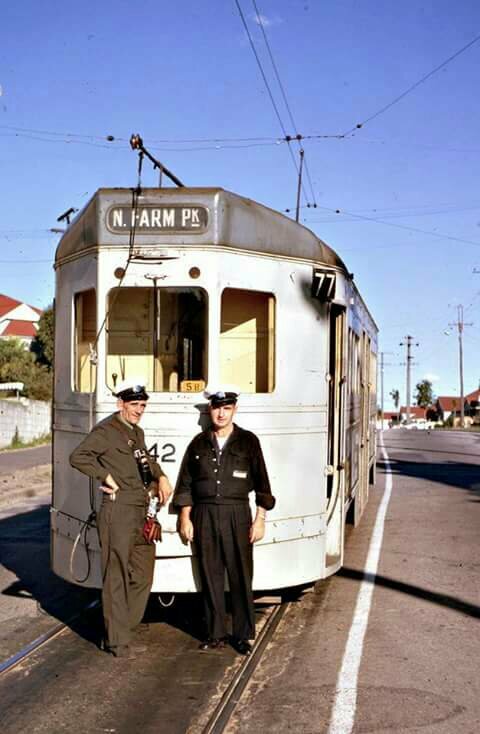 It is interesting that in the 1950s, Melbourne had 24 hour tram services. Be nice to have a couple of modern light rail routes with tunnelled sections to speed up travel times and compliment the current network. I agree, the comparisons aren't perfect, and journey speed and reliability aren't the be all and end all of customer satisfaction. My point really is that Brisbane's trams weren't an ideal system undone by some grand conspiracy between car loving politicians and the RACQ. Rather, the tram system was the victim of a few decades of under-investment and neglect, combined with a lack of political will to make the unpopular decision that would have been required to fix the problems that had been allowed to develop. Which sounds incredibly familiar really. 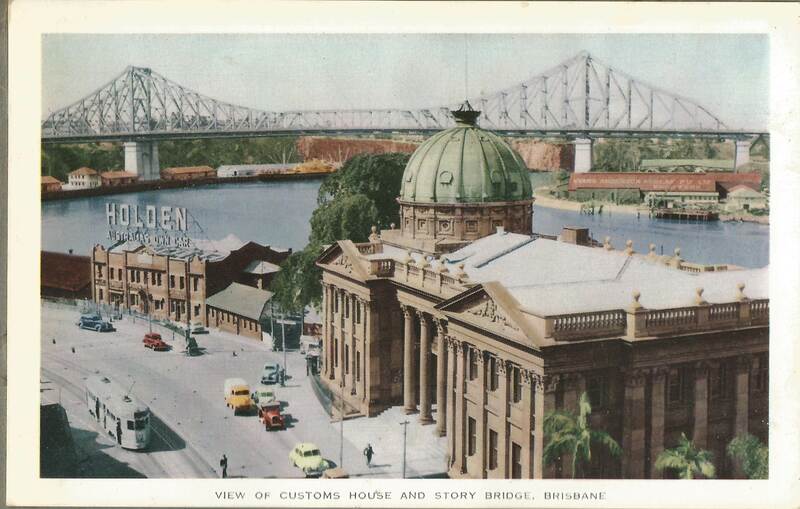 Some postcards of Brisbane in the early 1950s. 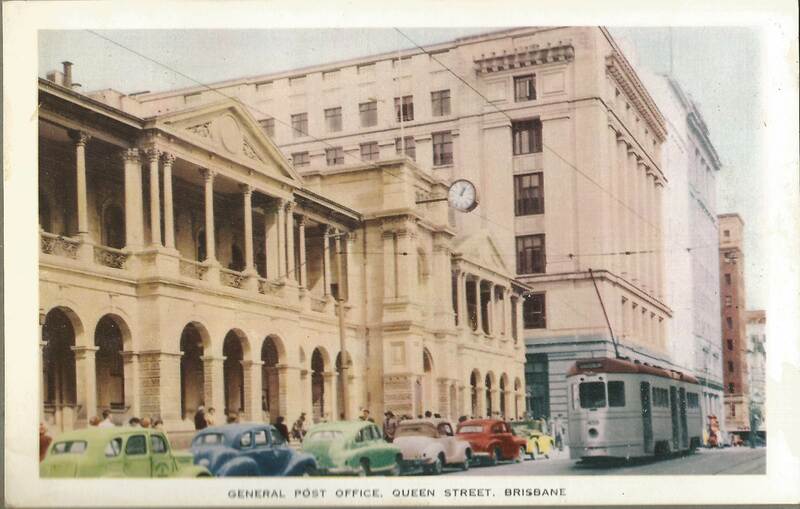 Brisbane would be a very different city today had the trams remained that's for sure. The system would have evolved as have other cities that had the smarts to stick with the trams. It is getting to be a congested conglomerate of car centric crap sadly these days. The tramway museum are doing their annual night run to commemorate the final day this evening. ^ thanks for the reminder ..
My father drove me to see the last tram depart Salisbury for the City. Nearly everyone on board had a wrench or a screwdriver - determined to take a souvenir home. I envisaged the tram arriving at the other end as a driver in his chair, a motor and chassis!